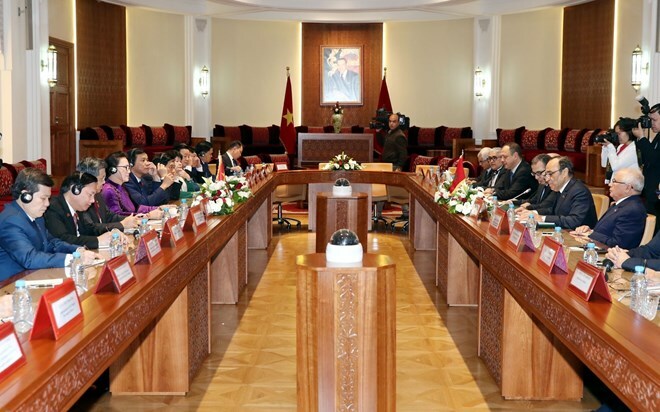 Rabat (VNA) – Vietnam and Morocco signed several memoranda of understanding (MoU) on environmental, trade and industrial cooperation in Rabat city on March 28, during an official visit to the African nation by Chairwoman of the Vietnamese National Assembly Nguyen Thi Kim Ngan. The Vietnamese Ministry of Natural Resources and Environment and the Moroccan Ministry of Energy, Mines and Sustainable Development inked an MoU on cooperation in environment and sustainable development. Moroccan Minister Aziz Rabbah said as a developing nation, his country pays special attention to sustainable development and building a green economy. With the signing of this document, Vietnam and Morocco will become companions in fighting climate change and promoting sustainable development. He also stressed the importance of stronger cooperation in this regard between the two countries, adding that both sides need to realise the deals signed this time for the sake of sustainable development and future generations. Vietnamese Minister Tran Hong Ha said like Morocco, Vietnam is a beautiful country with many natural wonders and a stable security and political environment. However, the strong development process is posing problems to sustainable development. The country defines developing a green and sustainable economy as an important task which needs the two countries’ cooperation and experience sharing. Also on March 28, the Vietnamese Ministry of Industry and Trade and the Moroccan Ministry of Industry, Investment, Trade and the Digital Economy signed an MoU on establishing a sub-committee for cooperation in commerce and industry (SCCCI). The SCCCI establishment aims to enhance win-win commercial and industrial partnerships. On this occasion, the two ministries inked another MoU on their cooperation. Accordingly, both sides agreed to enhance collaboration in trade and industry so as to bolster bilateral trade and the exchange of industrial knowledge and technology. They will increase sharing information about business opportunities, especially in the commodities with high trading potential like agricultural and aquatic products, textile-garment, footwear, fibres, mobile phones and components, computers, electronic products and components, phosphate, and coal. The ministries will step up ties in the fields of their strength such as agricultural business, electronics and mechanics industries, renewable energy, and the production of textile-garment, chemicals and fertilisers. They will also share experience in making trade and industry developing mechanisms and policies, promote investment in and establishment of joint ventures, and boost manpower training to develop sectors, especially industrial and technical ones.